PROVIDENCE, R.I. - Kasper Björkqvist and Jason O'Neill scored shorthanded goals 2:41 apart in the first period as the No. 14 Providence College men's hockey team scored a key 4-1 win over No. 8 Northeastern on Friday night at Schneider Arena. - Northeastern jumped out to an early 1-0 lead at the 17:15 mark of the first period. Brandon Hawkins battled for the puck on the boards before delivering a pass to Ryan Shea in the slot that he finished with a slap shot. - Providence knotted the game at 1-1 with 10:55 left in the period. Spenser Young slid a pass across the blue line to Jacob Bryson, who ripped a slap shot from the point that deflected off a defender and in. - The Friars took two penalties in the first period but were able to capitalize shorthanded on both. - Kasper Björkqvist put the Friars up 2-1 after corralling the puck near the red line, beating a defenseman to the edge and firing a wrister to Cayden Primeau's short side. - Björkqvist's goal was his 11th of the season. Jason O'Neill recorded his fourth assist of the season on the goal. - Young recorded his second assist of the game on the play, as he was credited with the secondary assist. - With 4:29 left in the period, Jason O'Neill extended the lead to two. O'Neill brought the puck up on a 2-on-1 rush before burying a wrist shot to Primeau's blocker side. - The Friars were dominant in the middle stanza, outshooting the Huskies 16-1. Northeastern went without a shot for the first 15 minutes of the period. - Providence had two power play opportunities in the second period. They were unable to capitalize with the man-advantage, despite recording three shots on net. - The Huskies were held to only seven shots in the third period after tallying just one in the second. - Greg Printz sealed the victory with an empty netter with 30 seconds remaining. Hayden Hawkey was credited with the assist. - Hawkey finished with 19 saves, while Primeau made 34 for Northeastern. - Neither team converted on the power play for the entirety of the game, they each finished 0-3. - O'Neill now rides a career-long three-game point streak and has totaled two goals and three assists in that span. - The Friars scored two shorthanded goals in a game for the first time since Feb. 7, 2015 against UConn (Steve McParland and Noel Acciari). - Providence is now unbeaten in the last five games against Northeastern (4-0-1) dating back to November of 2016. - The Friars earned their first win over a top-10 team this season and are 2-4-2 against ranked teams overall this season. 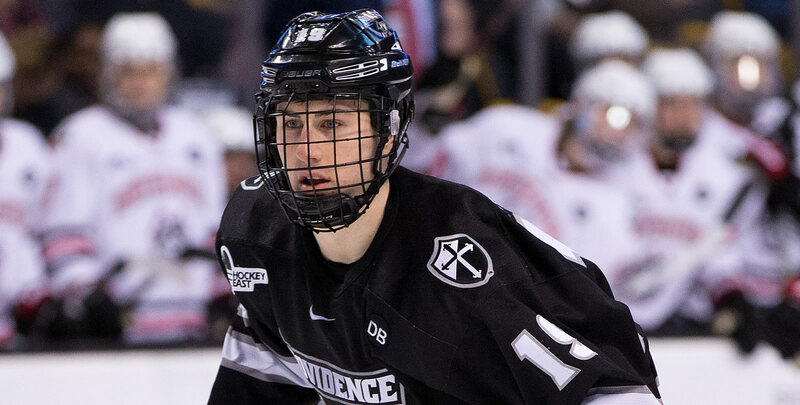 - Providence has outshot its opponents in all but one game this season. - Hawkey recorded his third career assist on Greg Printz's empty net goal in the waning seconds. 1-0 (Northeastern) - 2:45/1st - EV - Ryan Shea (Felipe, Hawkins) - Hawkins pass from the right corner to the slot for a Shea one-timer. 1-1 (Providence) - 9:05/1st - EV - Jacob Bryson (Young, Conway) - Slap shot that deflected off a defenseman and in. 3-1 (Providence) - 15:31/1st - SH - Jason O'Neill - 2-on-1 rush shorthanded with Printz and O'Neill, who snapped a shot past the blocker of Primeau. 4-1 (Providence) - 19:30/3rd - EV - Greg Printz (Hawkey) - Empty net goal from just inside the Northeastern blue line. The Friars face the Huskies again tomorrow night (Jan. 26) at 7:00 p.m. at Matthews Arena in Boston, Mass.